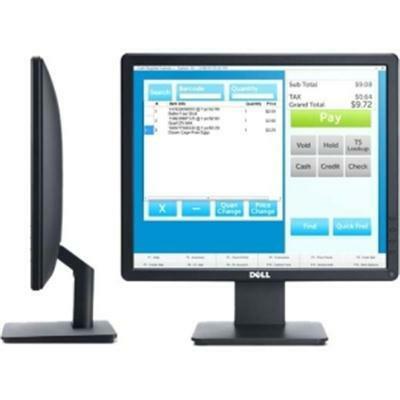 Dell 17" Monitor E1715S. Bezel Color Black. Viewable Image Size - Horizontal: 337.92 mm (13.30 inches) Vertical: 270.33 mm (10.64 inches). Pixel Pitch 0.264 mm. Typical Response Time 5 ms typical (Black to White). Aspect Ratio 5:4. Viewing Angle (Vertical/Horizontal) 160 /170 . Luminance (Brightness) 250 cd/m (typical). Contrast Ratio (Typical) Dynamic Contrast Ratio (DCR) 1000:1 (typical). Backlights WLED. Color Gamut 85% (CIE 1976) / 72% (CIE 1931). Number of Colors 16.7 Million. Pixel per Inch 96. Panel Technology Surface TN (Twisted Nematic) Anti-Glare. Monitor Connectivity VGA DisplayPort (v1.2). Swivel(Left and Right) and Tilt Tilt only (5 /21 ). AC input voltage 100 VAC to 240 VAC/50 Hz or 60 Hz + 3 Hz/1.5 A (Max.). Operating (Typical - Maximum) 11W - 15W.